This year's Scouting for Food is scheduled for the weekend of Nov 12 (hanger distribution) and Nov 19 (collection). For those new to scouting: this is a wonderful opportunity for our scouts to participate in a community service project. The food that we collect goes to the Contra Costa Food Bank from where it is distributed to those in need. Den leaders are responsible for ensuring their den's participation in this event. If you will be much later than noon, you can bring your collection to the Meridian District's food collection site at the Danville LDS at 655 Old Orchard Road. They will be open till 2:30pm. After 2:30pm, you will have to take your collection to the Contra Costa Food Bank located at 4010 Nelson Avenue in Concord (925.676.7534) during their regular hours. Please let them know your collection is from the Meridian District's Scouting for food project. Ideas to help us collect more food on the 19th! Knock on every door that received a door hanger and did not leave a donation. Maybe they forgot to put out their food or would give if asked. All participating scouts receive a patch. This year's Scouting for Food is scheduled for the weekend of Nov 14 (hanger distribution) and Nov 21 (collection). Ideas to help us collect more food on the 15th! This year's Scouting for Food is scheduled for Nov 9 (hanger distribution) and Nov 16 (collection). Our pack did a great job covering all the neighborhoods assigned to us. We didn't collect as much food as we did last year, but certainly enough to make a difference. 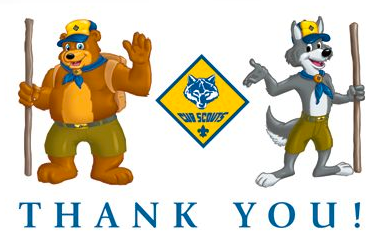 Den leaders, please let Ammy know how many scouts participated from your den so that she can order patches. 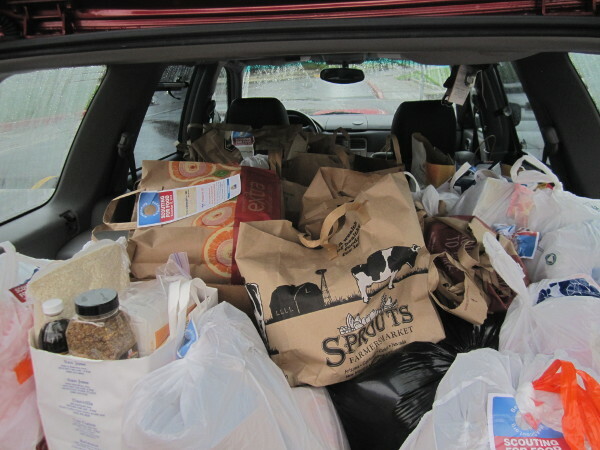 We are going to collect food for the Contra Costa food bank again this year. I will leave the door hangers at John's house so the den leaders can pick them up at the committee meeting this Thursday. The den leaders are responsible for coordinating and communicating their den's participation in this event. The area assigned is roughly proportional to the number of scouts in each den. Note that a few of the assignments are different from last year's. As per feedback received last year, we will not be distributing flyers in apartment buildings. (a bit later is okay too, call me if you are delayed). Our Scouting for Food event was once again a huge success and I want to take this opportunity to thank program coordinators Stella Lei and Ada Ip, the Den Leaders and all of the Scouts that participated. Our scouts were able to fill a 6x10 trailer with donations for the needy and this large collection made quite an impression at the Food Bank collection center. Thank you for helping make the Thanksgiving holiday a little brighter for those that are less fortunate. This event is at the heart of what Cub Scouts is about. Happy Thanksgiving to you and your families. Have a safe and wonderful holiday. Our Pack will be picking up food donations this Saturday. Please start collection in your assigned area after 9am and bring the donation to outside of MPR between 10-11am. It may rain. Be Prepared! And be safe! Den leaders and/or representatives, please provide names of scouts participated so that they can be recognized. Scouting for food maps are finalized. Each den is responsible for an area as depicted below (click on the colored zone to see assignment). Door hangers will be distributed to den leaders/representatives beginning tomorrow night at the committee meeting. 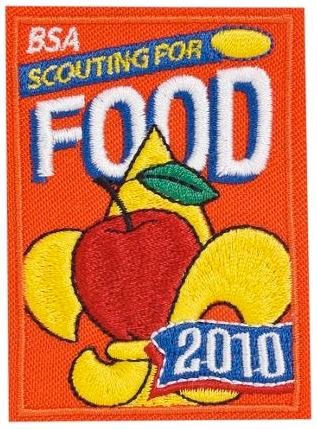 Participating Scouts will earn the Scouting for food patch and satisfy one of the service requirements of the Year of Celebration awards. This is a worthy cause and I hope everyone will lend a helping hand. More than ever before, our community needs us to "Do a Good Turn Daily"! Our pack will be participating in the Scouting for Food event which runs from November 13th-20th. The goal is to place the Scouting for Food hangers on the front door knobs in our assigned area starting November 13th. We would then pick-up the donated items on November 20th. Each Den must assign a Den representative to pick up maps with high-lighted routes assigned to each Den and the door hangers. Please arrange to pick them up at the committee meeting this Thursday. The Den Leaders will need to coordinate their Cub Scouts hanging the door hangers on or after Nov 13th before it gets dark. The Dens will need to pick up the donations from their assigned routes after 9:00 am on Saturday November 20th and bring it to outside Coyote Creek School’s MPR between 10 AM and 11 AM. Den leaders should ensure that their den has representation and, at a minimum, arrange for collection of the high-lighted route maps and hangers. The den leaders are responsible for coordinating and communicating their den's participation in this event. Here is a document regarding the GENERAL event information. (Details listed in this email take precedence.) A map of your assigned area will be given to you when the Den representatives get the door hangers. Please address any questions regarding the event to Stella and Ada and cc: Cubmaster Macey and Committee Chair Steve.